Jill Crossland is a British pianist who has studied with Paul Badura-Skoda, among others. This seems to be her first recording (though since there is no information about the artist in the CD notes, I am basing this on the fact that I find nothing by her at any on-line music dealers). 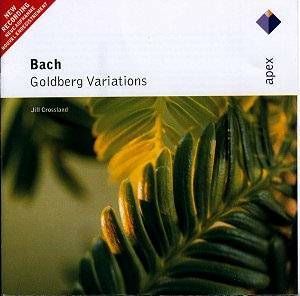 A performer of both romantic music and Bach, Crossland here tries to stand out from the herd with this recording of the Goldberg Variations. So, how can a performer make an impact when recording such a work? Of the dozens of recordings available on piano, is it possible that there is nothing left to say about this work? Crossland takes a very strange tack with this recording. She begins with an almost atomized reading of the opening aria. At over six minutes this is the longest interpretation I am familiar with. She performs almost like Wolfgang Rübsam (who has recorded many of Bach's keyboard works for Naxos), with a tempo that is not only slow but that makes you notice how slow it is by her lack of legato. There is something interesting here, but the fast tempo (faster than many performers) of the first variation broke me from my spell. I was entranced by the aria, but the contrast with the first variation came as a shock. Crossland continues with this ambiguous interpretation throughout the set. She plays the slow variations very slowly, often with little or no legato to stress this tempo (such as in the 7th and 9th variations), yet this lack of legato is not always retained throughout the variation or repeat. Dynamically, Crossland has strengths and weaknesses. Her overly forte bass notes in the repeats of the 5th variation sound like a hammer striking an anvil, and seem at odds with the overall rhythm. But her beginning of the 10th variation, with a subtle increase in dynamics as the opening section progresses, is quite interesting. Yet, again, the bass notes resound far too strongly at times in the repeat. This seems to be more a problem with the way the piano is miked, and the excessive reverb may also contribute to it. The most impressive variation in this set is the 25th, which is one of Bach's most moving keyboard movements and is a piece that can stand on its own. As with the aria, Crossland plays this very, very slowly (almost 9 minutes). This is an interesting approach, but I cannot help but think that she overdoes it just a bit. While I tend to prefer slow performances of this movement, I find this too slow. There are too many moments where the music becomes unravelled, where the thread is lost and the listener can miss out on Bach's profound musical statements. Several things about this disc beg the question of whether Warner is doing artists a justice with the releases in this series. Most of the Apex titles are re-releases of "classic" recordings at budget price, but they have released a few discs of relatively unknown artists, such as Crossland. There is no information on the artist, and this is obviously a recording that languished in a drawer someplace - it was recorded 5 years ago - waiting for an opportunity to be released. In addition, an approach as idiosyncratic as Crossland's deserves an explanation from the artist (in the notes). What will become of this recording and Jill Crossland? Obviously, Warner is not very concerned. While I wouldn't recommend this recording to listeners looking for a first disc of the Goldberg Variations, the curious will find much here that may pique their interest. I'm not totally convinced by her approach, but I'm certainly intrigued by it, and am looking forward to hearing more from this young pianist.